Goat is the most consumed meat in the world, though not hugely popular in the US. It is very popular in Guyana and the rest of the Caribbean. Goat has a bit gamy but is closest to Lamb in flavor. 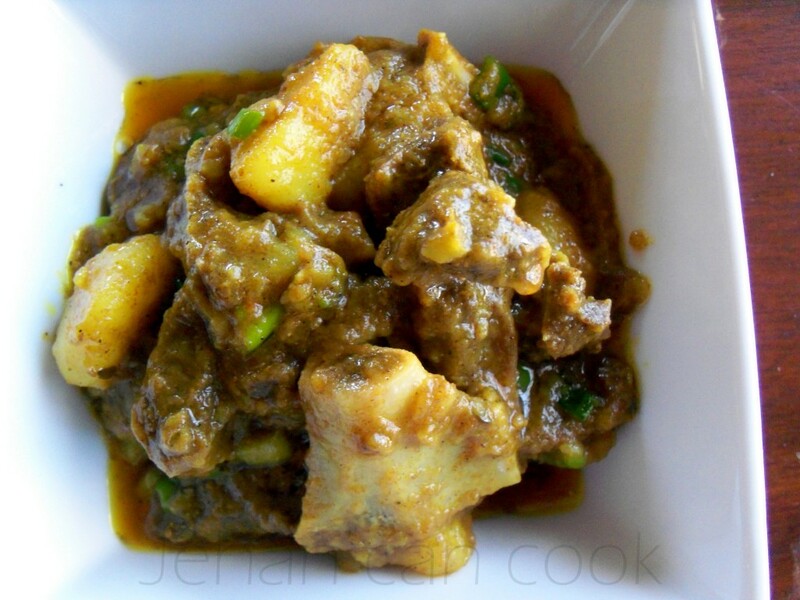 Though it can be cooked in many ways, the only way we Guyanese cook goat is curried. To be quite honest, we Guyanese curry EVERYTHING. Chicken curry, duck curry, fish curry, shrimp curry, squid curry, labba (paca) curry, iguana curry…you get the idea. It only makes sense that we would curry goat. I decided to make roti and chicken curry ,but my chicken went bad so I made my way to the store to pick up chicken but decided to go with goat instead. I love goat curry. There something about the flavor of the goat that goes really well with the spiciness of curry. 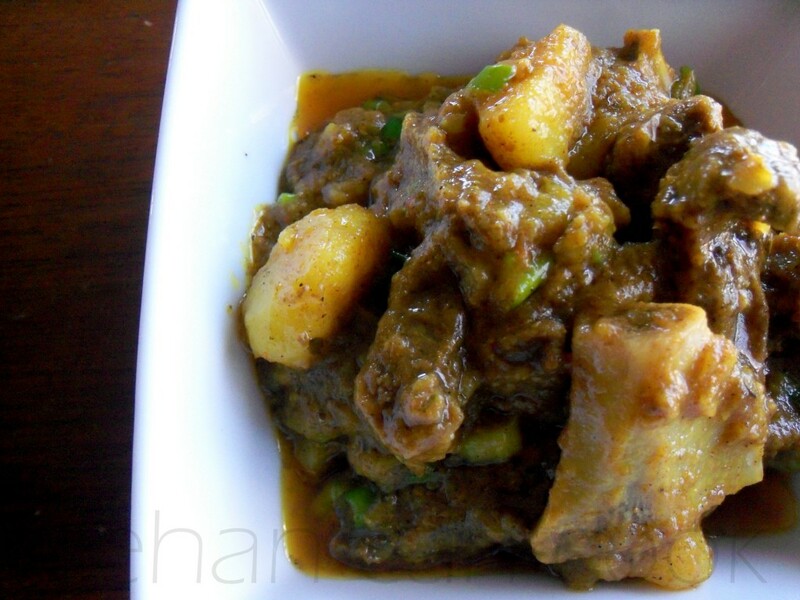 Don’t be afraid of the fat that lies between the meat of it goat, once cooked, it results in tender, juicy nuggets of meat in a rich spicy sauce that is perfect for roti. I thoroughly enjoyed my lunch, and dinner, and breakfast. Place goat in a bowl with enough water to cover and juice of 1 lime. Rinse thoroughly. Add garlic, thyme, scotch bonnet pepper and salt and stir to coat. Set aside for at least 4 hours. To make Paste, mix all curry powder, cumin, garam masala, allspice and water. Heat canola oil in a large pot on a medium fire. Add curry paste and fry for about 4-5 minutes. Add seasoned goat, stir well to coat with curry. Cook slowly for 20 to 25 minutes. Add potatoes and enough water to cover the goat. Bring to a boil, turn fire down to low and simmer until goat is tender. Remove from heat and add chopped scallion to garnish. Quick Tip: If using a pressure cooker, after adding the meat to the curry paste let goat cook in it’s own juice for 15 minutes. Add enough water to cover and pressure for 7 minutes after the pressure cooker starts to whistle. Check for tenderness. Add potatoes and cook until tender. Next Post The most important meal of the day. 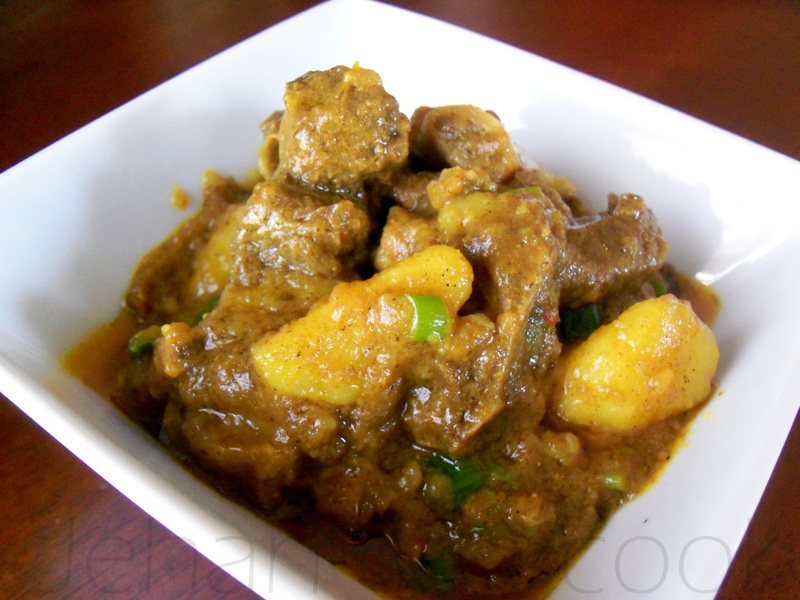 Awesome looking curry goat. Yum. Looks good. And easy! I like goat so I may give it a try. OH my word… I love curry, in any way, in any form. This just looks super. Curried iguana?! Oh wow, that’s a new one. Goat is a really pleasant-tasting meat. It’s so nice when you cook him low an slow too. So tender! I love curried goat! However, I now live in the back of beyond, where goat would be difficult to come by, in which case what would sub best? Beef? Pork? Fatty cuts or braising cuts? Also, what is the 1/4 cup curry? Is that a basic curry powder? Beef would be an excellent substitute, a somewhat fatty cut would work. I just made and tasted this delicious meal. This was by far the best curry goat I have ever made. Thank you so much!! This is on the short list menu to make as found a market here in Pittsburgh where i can get some goat meat that I will pick up this weekend as well some Cow Foot. I’m not sure if you have a recipe for that one that i can remember. I am Caribbean and i cooked this recipe and it tasted like the real thing. Loved it, thank you.